ORLANDO, FL – The American Sleep and Breathing Academy’s work with the National Football League Players Association (NFLPA) continued last month prior to the NFL’s Pro Bowl game in Orlando, Florida. The relationship has led to real benefits for NFL players while continuing to raise awareness among the general public, many of whom pay attention to the actions of their grid-iron heroes. Dr. Ronny Rosenbaum, DMD, PA, helped foster that ASBA/NFLPA relationship at last month’s Pro Bowl game. As a veteran private practice dentist, Rosenbaum discovered dental sleep medicine a few years ago, and it quickly became his passion. 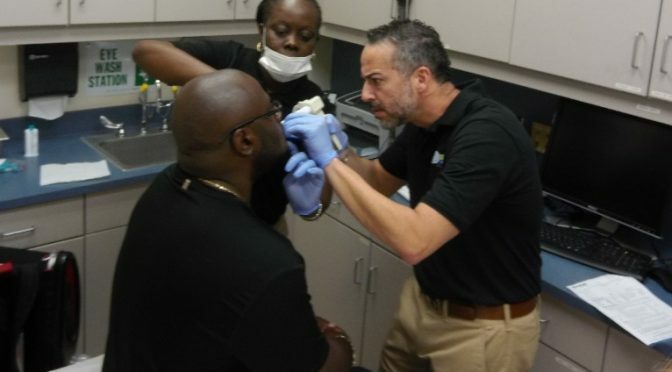 With ASBA Diplomate status secured, Rosenbaum got the invite to the 2018 Pro Bowl and eventually took impressions for 25 NFL players at the nearby University of Central Florida’s medical facility during the same day health screening event. Recently, Rosenbaum has been working with Sleep Group Solutions (SGS) and Rani Ben-David, SGS’ president and founder, using the pharyngometer to measure the airway. “We also test the nasal cavity,” says Rosenbaum, who intends to continue lecturing on behalf of SGS in 2018 and beyond. To register for the ASBA Annual Meeting and add your staff to the Boot Camp, visit sleep-conference.com. To find out more about Project Rose, email David Gergen at gxployer@aol.com or call 602-478-9713. Publisher of Sleep Diagnosis and Therapy Journal the Official publication of the American Sleep and Breathing Academy, the Journal is a clinical and technical publication for dental and medical professionals. In the days leading up to February 4th, 2018, most of the country was preparing for what is referred to as “The Big Game”. The city of Minneapolis was covered with posters that said “Welcome to The Bold North”, likely referring to the below freezing temperatures that Minnesota is famous for in the winter. Visitors and locals alike stayed warm indoors, but the men who paved the way for the “Big Game” as we know it today were forging a different path that didn’t lead to a field or stadium, but to an office located in the Medical Arts Building – Downtown Minneapolis that saw the likes Mike Singletary, Carl Eller, Earl Campbell and Mike Haynes. 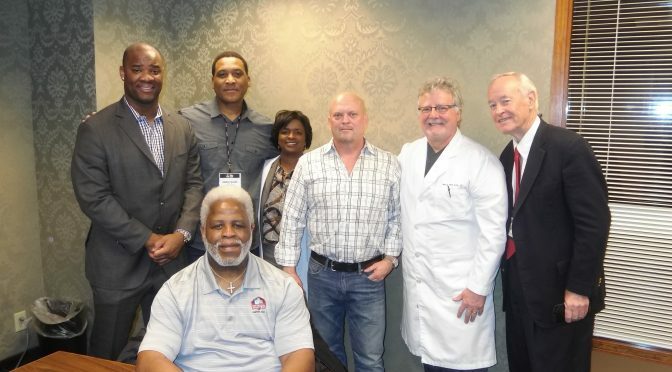 The freezing cold winds of the Bold North didn’t stop former NFL players from attending the NFLPA sponsored sleep apnea screening provided by Project Rose and Pro Player Health Alliance (PPHA) on February 1-2, 2018. When David Gergen, CEO OF PPHA, inquired space for the event, Dr. Mark Wilson, DDS was honored to provide his dental/medical office. Dr. Wilson is known as one of the top periodontists in the country and has been trained in sleep for over ten years. Upon arrival, the retired professional athletes were directed to sign official consent forms that allowed their data to be used for research. After completing screener forms that determine if they are at high risk for sleep apnea, Dr. Inell Rosario, MD reviewed the findings and, when medically indicated, ordered home sleep tests (HST) for them. Project Rose, led by NFL great Gary Baxter, provided HST’s for the players that weekend. Results were immediately uploaded and reviewed the next day and treatment options were provided. 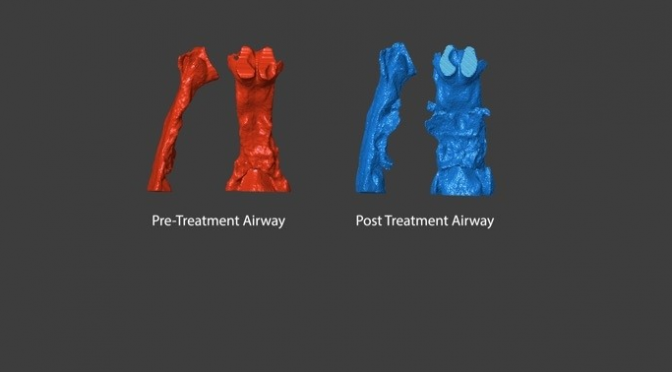 Dr. Mark Wilson, DDS and Dr. Greg Ross, who are sleep dentists and Diplomates of the American Sleep and Breathing Academy (ASBA), were able to take digital scans of the players’ teeth to have Gergen’s Sleep Appliance Lab begin fabricating instantly. David Gergen only refers ASBA Diplomates to treat the former NFL players. To become a Diplomate of the ASBA, click here. To register for the ASBA Annual Conference and see the likes of NFL greats mentioned in this article and previous articles, click here. Sleep And Wellness Conference Keynote Speech – A Cure for Sleep Apnea? LAS VEGAS – Can a chronic condition such as sleep disordered breathing be eliminated? It’s ultimately a scientific question, but Dave Singh, DMD, PhD, DDSc, is also quick to point out that the answer is not a threat to anyone’s livelihood. Viewed as a whole, Singh sees vast opportunity, and his optimism is infectious. “The future of dental sleep medicine is off the charts,” he says. “It’s the right thing at the right time for the right reasons. I’ve been in the field for a long time, and now we’re seeing public awareness of the issue, and a realization of how sleep apnea affects overall health. In an effort to cement dental sleep medicine within the larger medical world, Singh is working with two university hospitals in the United States to eventually formulate a new specialty, curriculum, and residency training. Dr. Singh is a Diplomate of the American Sleep and Breathing Academy. He is the founder of the field of pneumopedics and cranofacial epigenetics, including epigenetic orthodontics, having realized a few years ago that there is a natural way for the body to remodel the upper airway, reshape bone and move teeth into their correct positions painlessly without the use of surgery or drugs. The post New Study: Multiple OSA Factors Must Be Considered appeared first on Sleep Diagnosis and Therapy. The post Good Start and Reinforcement Necessary for CPAP Compliance appeared first on Sleep Diagnosis and Therapy. Sleep bruxism related to obstructive sleep apnea: the effect of continuous positive airway pressure.